When you flush your toilet, the contents disappear… when you flip on lights, your room is lit… when you place your trash at the end of the drive, its gone later in the day. Traffic signals function and traffic moves, grass in the neighborhood park grows and gets mowed, potholes get filled and normally, we don’t think twice about how it all happens. This week is National Public Works Week and an opportunity to say thank you to the men and women who build and maintain our communities and who’s hard work make our lives easier. American Public Works Association, the organization which advocates for these services created a fitting tagline for 2016- “Public Works, Always There.” Work done by public works professionals 52 weeks a year, has become so taken for granted we typically only think about infrastructure when something goes wrong. Think for a moment how your life would be different if you started your day by getting a bucket of water from the creek; this scenario highlights the efforts required to keep our communities safe, healthy and clean. Infrastructure encompasses everything from the water main in your street to the Hoover Dam; from the service connection at your house to the electrical grid spanning the country; and from the multi-use path in the park to the interstate highway network. Recently, the national spotlight has focused on the water crisis in Flint, Michigan. Feel good stories resonate about the church or civic organization collecting water donations for those immediately affected. American’s charitable nature is heartwarming, however, Flint is only the tip of the iceberg if we research just how fragile our nation’s infrastructure has become. Water is just one parameter of the dismal state of our nation’s aging infrastructure. American Water Works Association estimates there are 240,000 water main breaks in the US per year. These water shutdowns and leaky water pipes are more than an inconvenience. The American Society of Civil Engineers Report Card for America’s Infrastructure estimates these water delivery issues will cost businesses a projected $147 billion and households almost $60 billion by the year 2020. Couple these problems with the continual droughts wreaking havoc on the water supply in parts of the country and the magnitude of the dilemma becomes clearer. Whether it’s water or transit challenges, the common denominator behind these pressing issues is a lack of investment. It’s no secret that a backlog of needed improvements and lack of funding has left us with congested roadways, overflowing sewers, and woefully inadequate transit systems. Infrastructure is the foundation that connects the nation’s businesses, communities, and people. Historically, infrastructure was a critical factor driving our economy and improving our quality of life. Yet today, our infrastructure systems are failing to keep pace with our current and expanding needs, and infrastructure investment is faltering. 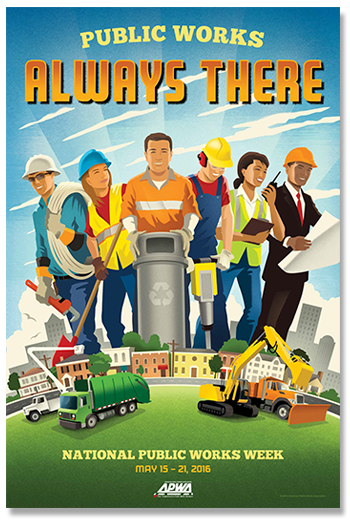 High resolution image version of the 2016 Poster may be downloaded from American Public Works Association. We have reached a critical juncture and must decide not when, but how we will invest further in our infrastructure. Those of us in the engineering profession see firsthand the needs required and recognize the financial commitment needed today to make our vision of the future a reality – an American infrastructure system that once was and will need to be again the source of our prosperity. Talk to your elected officials and encourage them to seek out solutions for funding and to recognize it won’t happen overnight, but must start somewhere. In the meantime, remember to say thank you this week to the unsung heroes who maintain our streets, pipes and power.